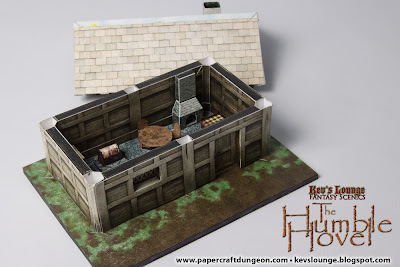 The Humble Hovel is the first of a series of 3D papercraft buildings, excellent for tabletop wargames, skirmish games and RPGs. The roof and walls can be removed to provide easy access to the interior and it comes with a bonus pack of furniture items to decorate the place and provide some cover and terrain advantage in game. 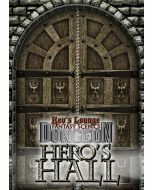 The furniture pack is designed to be completely compatible with every Kev's Lounge Dungeon Tile Set released to date. 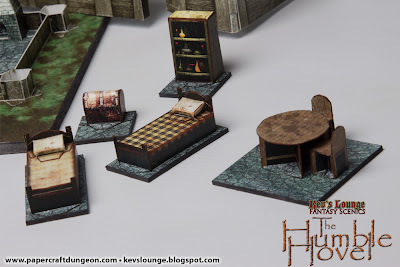 The Humble Hovel is a useful, customisable, and beautiful scenery piece perfect for use in role-playing games and tabletop wargames that use 28-30mm miniatures. With a removable roof, and walls, you can easily access the interior in the middle of a game. The design gives you a sturdy, attractive model that will certainly see a fair bit of use on your table! This set is customisable to a great degree, allowing you to adjust it to suit your gaming needs, skill level and personal taste. With a variety of options for the outside grounds, inside floors, walls, doors, windows and rooves, there are literally hundreds of possible combinations. Using just this one set, you could make an entire village of Humble Hovels, with no two of them being exactly alike! One of the real attractions of the Humble Hovel is the awesome, intricate 3D details we've added. They add a ton of visual interest and realism for those out there who are up for the challenge! We've made the 3d details optional though, so those who don't want to fuss around with lots and lots of pieces, or just want to build the model quickly, can opt to turn it off and build a simpler version. 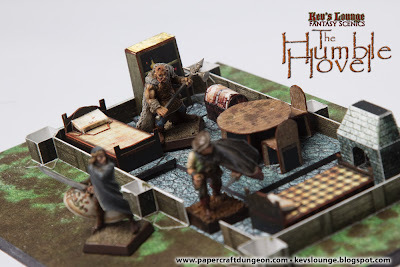 Of course, the Humble Hovel is not just a pretty little cardboard house... it's there to be used while playing games! We've taken that into account in the design. For the games that use it, we've included an optional 1-Inch grid on the floor, which comes in two styles. The design of the piece makes it very sturdy and tough, despite the materials used to construct it, so it can handle a lot of the perils of being a piece of scenery! As mentioned before, the roof and walls are removable, to provide you easy access to the interior, should the action head indoors! 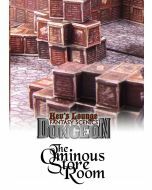 You can change the floor textures in the PDF to match the floors in your hovel, as well as making the furniture items completely compatible with every Kev's Lounge Dungeon Tile set released to date! 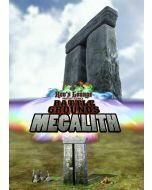 65 page instruction manual, in PDF format, optimised for screen view to save you ink, and bookmarked for easy navigation. Details every step of the process with clear, full colour illustrations. Miniatures used in pictures are strictly for illustration purposes and are not included in the purchase. Photography by Bronwyn Sharrock Photography.